Es musste so kommen. Stunden stand ich auf dem Steg, starrte in Richtung der Berge, den Rücken zum See, wartete. Ich sah sie bereits von weitem, wie sie langsam den kleinen Pfad hinunterkam. Sie hielt den Kopf gesenkt, tat so als würde sie mich nicht sehen. Selbst jetzt fielen mir noch all die kleinen Details auf, die ich einmal so an ihr liebte. Details von denen ich ihr nie erzählt hatte, weil ich zu feige war. Weil wir zu jung waren. Weil sie nicht zugehört hätte. Weil all die Ausreden leichter zu ertragen waren, als ihr in die Augen zu sehen und ihr die Wahrheit zu sagen. Diese Augen, die selbst dann einen Schimmer von Traurigkeit in sich spiegelten wenn sie lächelte. Festumklammert in ihrer Hand hielt sie das Urteil, funkelnd in der Mittagssonne. Mit der Ruhe eines zum Tode Verurteilten, der sich in den Stuhl setzt und sich die Spritzen geben lässt, beobachtete ich jeden ihrer Schritte. Mein ganzes Leben wusste ich, dass es eines Tages so enden wurde. Ich fühlte fast eine Art Erleichtertung, dass es nun tatsächlich so kam. Für einen solchen Tag hätte ich mir Regen gewünscht. Heftiger Wind eventuell. Donner und Blitze, um der Dramatik gerecht zu werden. Aber am Himmel war keine einzige Wolke. Es war still. Keine Vögel die zwitscherten, noch nicht mal Blätter die im Wind raschelten. Als würde die Natur innehalten ob dem was in den nächsten Minuten passieren würde. Damals, als alles so kompliziert erschien war es im Nachhinhein doch einfach. Ich hätte nie eine andere Entscheidung treffen können. Diese Stille könnte wohl kaum treffender sein. Unser ganzes Leben war dominiert von Stille. Als sie schließlich vor mir stand sah sie mir minutenlang in die Augen. “Warum hast du es getan?” Ihre Stimme klang nach purer Verzweiflung. “Es war die einzige Möglichkeit,” erwiderte ich und drehte mich um. Der Ausblick auf den See sollte das letzte Bild sein, das sich in meine Augen einbrennt. Sie sollte mir nicht in die Augen sehen müssen bei dem was sie tun musste. Ich hörte sie schluchzen. Dann fiel ein Schuss. to let life in, or take it away once and for all. cost only a piece of your soul – another piece for a straw. to the unwanted city and westwards to the homeless city. except our eyes that look upon this world. where it all suddenly stops and rewinds. the shades of grey donated by a poet long gone. Princess is gone and there’s no Joy. 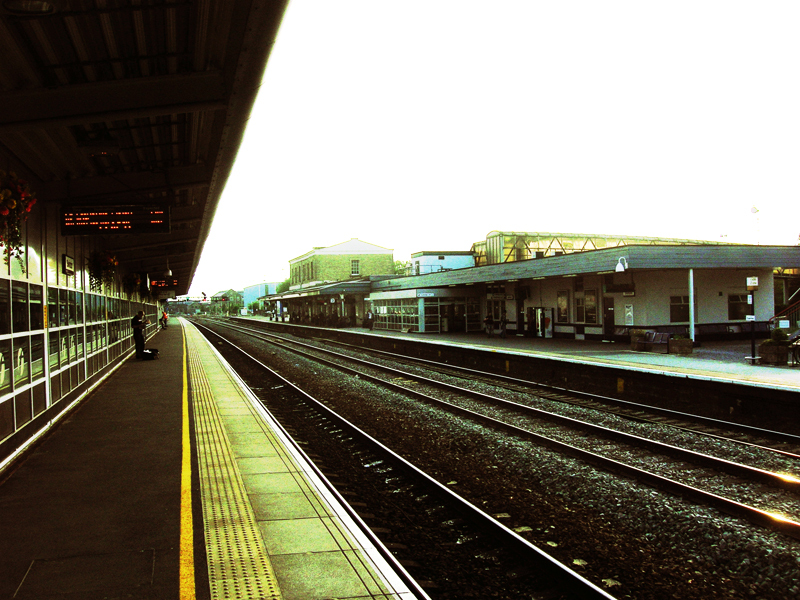 The railway station in Swindon, a large town midway between Cardiff and London. because red will be unfashionable this summer and so will be honesty and lies. They celebrate victory outside. Of what. Be paranoid, we stalk. We don’t need no CCTV. Everything is quite extraordinary if you look at it through a magnifying glass. Everything is pretty boring if you look at it through a magnifying glass again. smile like they mean it – perhaps they simply rehearsed in front of a mirror for years. There’s a funeral on the horizon, someone is burying the moon so that nights will be dark. We’ve dissipated stars millennia ago but ancient practices have it that wasn’t soon enough. because clouds in the desert just die, long before they ever weep. For the most part of the year, the sound of seagulls is the first sound I hear every morning when I open my window. It’s the background noise when I walk through the city center or hang out in the bay. It’s what proves to me that, whatever happens, the sun will rise again with a ruthless and wonderful certainty every day. Sad Autumn was a look upon my life, but as that life changed, so has the outlet. In a way it means this site will only be a continuation. But at the same time it will be something completely different. So here I am. As far as I can remember I never left my life behind the way I did the past weeks and months. I closed my blog, I deleted my accounts on all the social networking sites except for Facebook – which I reduced to a very minimal profile only so people could still contact me. I never really felt the need to go back to any of those services, nor did I wonder if I should go back to blogging. True, I registered this domain a few weeks ago, but ever since I only played around with the design – I never thought about actually putting the site online, that was only a goal at an unknown distance. Sometimes, however, the way is the goal. It certainly seems like that to me now that I look back upon the road that lies behind me. One of those many days while I was gone, Georges told me that letting go is probably one of the hardest thing you have to do in your life. It is. But occasionally that is exactly what you need. I stepped out of my own life, and spent a lot of time looking at it from the outside. I was proud of the choices I have taken so far. Not for a second did I regret the decision that eventually lead to me closing this blog. I lived every last second of each day to its fullest extent. I’ve never really been the kind of person who’d listen to his heart. I rationalized every decision, acted out every possible scenario in my head, over and over again. But then, just for a second, I listened – and I realized: if you go out into the world and give someone the power to hurt you so badly you wished you were dead, if you, even if just for a single moment, completely accept who you are and show it, then you are truly alive. It doesn’t matter whether you get hurt, either way you’ll wake up one morning and the only thought in your head will be the one thing that has kept humanity going for so long: I am alive, and that is without any doubt the most amazing thing. My heart is filled with love for my friends and family. And today, I will celebrate life in every possible way. It feels as though a whole lifetime has passed since I disappeared. And in a way it has. I am not the same person anymore. I look at the world, at the people around me in a different way. I’ve had to say goodbye for good to many friends that I really care about. I finally recognize the person that looks at me from the mirror, and I am happy to be that person. Granted, my life is by far not perfect. But what would I still have to strive for if it were?